Even in his lifetime Dr. Philip Syng Physick was known as the "Father of American Surgery". First in America to hold a Chair of Surgery at Pennsylvania Hospital, America's first hospital, Dr. Physick was famous for the compassion and tenderness his patients received, his inventiveness in creating tools and procedures, his speed in performing operations with those instruments, and for the insightful lectures his devoted students enjoyed. With the approach of the Bicentennial of his introduction of artificially carbonated flavored water to American in 2007, a descendent decided to recreate the Doctor's prescription in time to celebrate Dr. Physick's two hundred and thirty-ninth birthday. To mark this historic first, the Philadelphia Society for the Preservation of Landmarks,' (Landmarks), owners of the Federal period Physick House, established a festival to celebrate "Soda's Pop", and a remarkable number of other historic connections with his house. 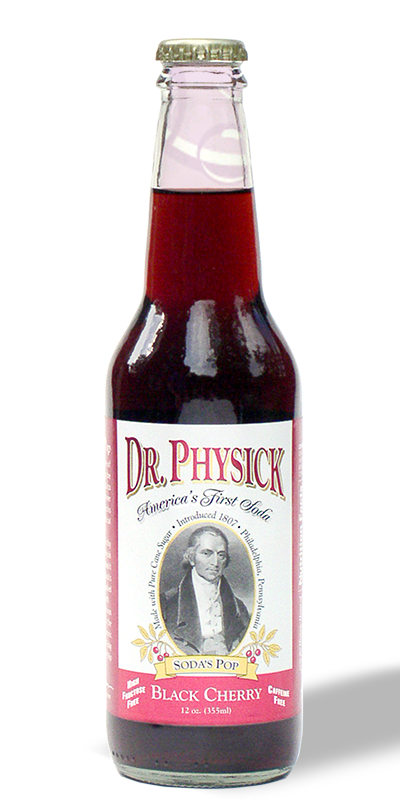 The first Philly Phyzz Festival was held in the spacious garden of the House Museum where Dr. Physick's delicious Black Cherry Soda was reintroduced to Philadelphia on his birthday, July 7, 2007. The Philly Phyzz Fest is now an annual event enjoyed by neighbors, friends and those visiting Philadelphia. Along the shady garden path of Physick House young and old have a chance to participate in a unique historic public reenactment, rediscover the fun of old-fashioned wooden toys and games, learn some new old skills, and talk with historic re-enactors. For children of all ages, the hands-on making of fizzy water is always pop-ular. In honor of Physick's friend and patient Dolly Madison, the making of homemade ice cream is a rare treat visitors can partake in. Eager volunteers enjoy cranking the ice cold churner filled with milk, cream, sugar and vanilla flavoring to make incredibly delicious homemade ice cream. Dr. Physick's friends' at Franklin Fountain supplements what is made at the festival with samples of their own homemade ice cream. Combined with a Dr. Physick, visitors can make a truly historic ice-cream soda. 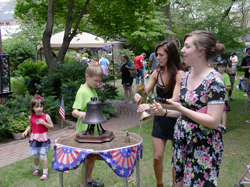 Along with the opportunity to take a guided tour of historic Physick House, in the garden visitors learn of, and even join in reenacting other historic events connected to the house and its inhabitants. On July 8, 1776, Colonel John Nixon climbed the steps of the old telescope platform behind the State House to make the first public reading of the Declaration of Independence. His home on that day was what is today the kitchen of Physick House. 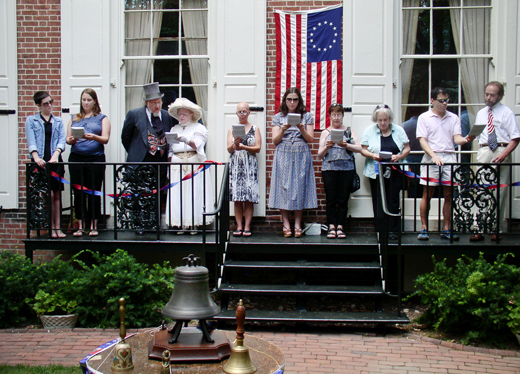 To commemorate Colonel Nixon's reading, each Philly Phyzz Fest features a group of volunteers reading of the Declaration of Independence from the balcony of Physick House. 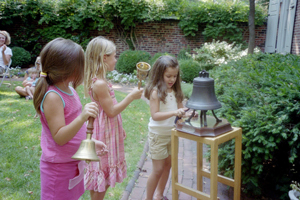 At the end of the reading of the Declaration, children try their hand at ringing bells to commemorate the legendary cracking of the Liberty Bell while tolling for Dr. Physick's patient Chief Justice John Marshall. Having come to Philadelphia for two previous successful operations by Dr. Physick, Chief Justice John Marshall returned a third time in 1835. Unable help him this time, the seventy-eight year old Chief Justice died under the doctor's care on the 6th of July. Two days later, after a view of his body at the old State House, Marshall's body was slowly moved down Chestnut Street for return by ship for to Richmond, Virginia. Legend has long held that it was while ringing for Chief Justice John Marshall's funeral procession that people first noticed the tone of the bell change in the course of the dirge. Inspection later found a vertical hairline crack in the bell and it would rarely be rung after that. Eight years later while ringing to commemorate George Washington's birthday the hairline crack was said to have noticeably widened. Later, this crack would be filed open with two bolts added for an attempted repair. This repair failed and a new, horizontal hairline crack sprang from the older crack. Rendered useless as a bell, as a symbol, The Liberty Bell still rings clear and strong. At each Philly Phyzz Festival the Bicentennial Liberty Bell of the State Society of the Cincinnati of Pennsylvania leads the choirs of bells rung following the reading of the Declaration. Headquarted at Physick House, The Cincinnati Society Room on the second floor of the museum is always a popular and appropriate part of the tour during Philadelphia's Freedom Week celebration. Coincidently on July 8, 1776, Philip Syng Physick, who had turned eight years old just the day before, was let out of school early with his class and told to go to the State House and hear an important announcement. Playing in the woods behind the hall, Physick and friends started playing and never heard a word Colonel Nixon read. Only at the end did they stop to listen when they heard people in the distance cheering, some booing, and someone yell loudly, "You are all going to hang for this". A well-inscribed copy of the Declaration that was approved By the Continental Congress on July 4, 1776 and announced by Colonel Nixon on July 8th was not ready to be signed for almost a month. On August 2, 1776, the brave signers of the Declaration of Independence dipped their quill pens into the Pennsylvania State House inkstand that had been made by Benjamin Franklin's longest-lived friend, and Dr. Phsyick's grandfather, silversmith Philip Syng Jr. Eleven years later Franklin, and another group of signers used this same inkstands to sign the United States Constitution. At the Phyzz Festival participants try their hand at using a reproduction of the Syng inkstand with quill pens to write in the old-fashioned way. Thomas Jefferson had written the Declaration of Independence on the second floor of the new house Jacob Graff had constructed the year before on the corner of Seventh and Market Street. Coincidently, Dr. Physick's father Edmund Physick held the mortgage on that property until 1805. Another coincident is that the portable desk that Thomas Jefferson designed and wrote the Declaration of Independence on was made in Philadelphia by cabinet maker Benjamin Randolph, a cousin of Dr. Physick's son-in-law, Dr. Jacob Randolph. The icing on the cake at the Philly Phyzz festival is the celebration of Dr. Physick's birthday. Born in Philadelphia on July 7, 1768, two large cakes are made and served by college interns at the festival each year to mark Dr. Physick's birthday and his introduction of Soda Pop to America in 1807. With hot dogs, soda, homemade ice cream, and cake, this festival is certainly a tasty experience for visitors. The Annual Philly Phyzz Festival is made possible with the help of enthusiast college interns participating in Landmarks' Education Program. 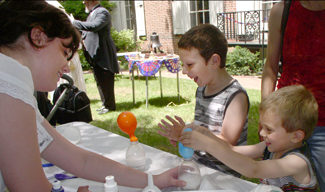 These young historians gain hands-on experience in planning and putting on this festival at Physick House. 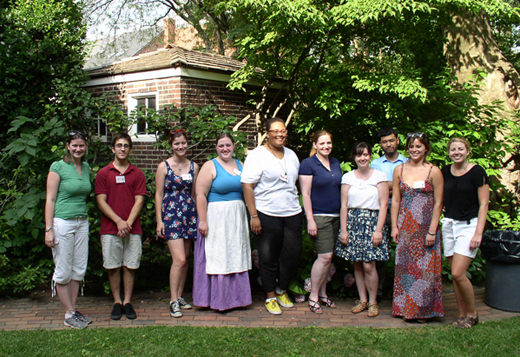 Landmarks' is grateful for the help provided by these dedicated students, the Physick House Committee volunteers, and to the visitors who make this a fun, and profitable event that supports Landmarks' preservation efforts and programs at the historic home of Dr. Philip Syng Physick.